Background and objective: There has been a dramatic increase in photothermal therapy as a minimally invasive treatment modality for cancer therapy due to the development of novel nano-materials as the light absorbing agents. PEG-functionalized Single-Walled carbon Nanotubes (PEG-SWNTs) with strong optical absorption in the broad visible and Near Infrared (NIR) waveband offer unique advantages for photothermal cancer therapy. The objective of this study is to investigate the rule of PEG-SWNTs in absorbing 785 nm NIR laser light and generating hyperthermia. 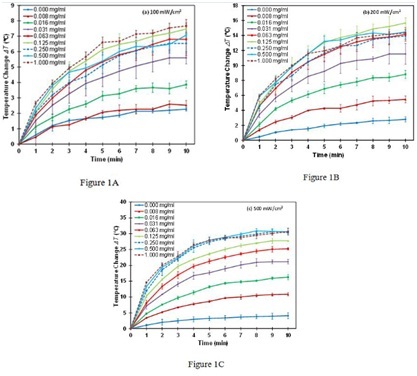 Materials and methods: Eight concentrations of PEG-SWNTs solutions were prepared by 2-fold serial dilution at concentrations of 1.0, 0.5, 0.25, 0.125, 0.0625, 0.0312, 0.0156 and 0.0078 mg/ml. The solvent without PEG-SWNTs was used as control. The temperature changes of the PEG-SWNTs solution during laser irradiation were monitored with an infrared thermometer. Three levels of laser power densities were chosen for the treatment including 100, 200 and 500 mW/cm2. Results and conclusion: The temperature of PEG-SWNTs solution increases linearly with laser power density, but nonlinearly with irradiation time and concentration. The solution temperature increases much faster within the first 3 minutes of irradiation and then gradually levels off as the irradiation approaching 10 minutes. The maximum temperature change (∆Tmax) in each solution increases sharply with increasing PEG-SWNTs concentration up to 0.125 mg/ml and eventually levels off beyond 0.25 mg/ml. Based on this observation, optimized treatment parameters (laser power density and SWNT concentration) could be obtained to raise the temperature by 10-30˚C sufficiently for causing cell apoptosis and/or necrosis. For in vitro cellular and in vivo tissue studies, similar experiments could be carried out to find the optimal treatment parameters. Single-Walled carbon Nanotubes (SWNTs) are hollow tubules of single-walled graphene. The electrical, thermal and spectral properties of SWNTs have been used to develop a number of new technologies for the detection, monitoring and therapy of diseases including cancer [1-4]. Although pulmonary toxicity of commercially sourced SWNTs was reported when administrated by direct intratracheal instillation , it was found that SWNTs were non-toxic to the experimental mice when administrated intravenously and only mild local inflammatory reactions were observed following implantation of SWNTs . Functionalization could further reduce the toxicity of SWNTs [7,8]. Furthermore the study by Sheardy et al., showed that the photothemal effect of pristine SWCNT and functionalized SWCNT is similar . It has attracted enormous interest in the use of SWNTs for biomedical imaging, drug delivery, cancer diagnosis and cancer therapy [10-12]. Carbon nanotubes have the capability to efficiently convert Near Infrared (NIR) radiation into heat by photoexcitation of their quantized lattice vibrations (phonons), which is advantageous for the development of next generation photothermal agents for laser cancer treatment [9,13-17]. Exposure to high temperatures for sufficient amount of time could cause permanent physical damage such as protein denaturation or membrane lysis . These effects have been used for direct cancer cell necrosis or apoptosis . Carbon nanotubes have extremely broad electromagnetic absorption spectrum, covering the visible, NIR, radio frequency and microwave bands [20,21] which provides the flexibility in the choice of treatment wavelength. As transmission of NIR and radio frequency through the body is minimally attenuated , photothermal agent based on carbon nanotubes is of particular interest for the treatment of non-superficial cancerous lesions in vivo. Most of the studies involving SWNTs or other nanoparticles-assisted photothermal treatment were based on high laser power density of 1-40 W/cm2 [23-28]. However, high laser power density could cause non-selective photothermal damage to the surrounding normal tissues. A mild treatment temperature with medium power density is more ideal for targeted phototherapy. It was found that hyperthermic treatments with modest temperature enhanced the efficacy of systemic chemotherapy of cancers . Photothermal heating with SWNTs and doxorubicin killed more cancer cells than photothermal heating with doxorubicin or SWNTs alone . These heating-assisted effects in combination with immunological therapy  or drug release switch  only need modest temperatures, which is easy to achieve with SWNTs. Application of SWNTs-assisted photothermal treatment requires knowledge of the temperature increases associated with SWNTs absorption . It has been shown that the threshold time of cell necrosis by thermal therapy changes with the temperature . Longer treatment time is needed for lower temperature, or vice versa. For example, cell necrosis requires 135 min at 43ºC, but only 5 sec at 57ºC [34,35]. Different temperature is needed depending on the treatment protocol or treatment objective. It is important to measure the temperature in SWNTs-assisted photothermal treatment in order to design a proper treatment plan. 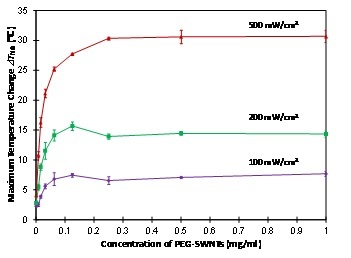 In this paper, we will focus on the photothermal properties of polyethylene glycol functionalized SWNTs (PEG-SWNTs) solution irradiated by 785 nm laser and investigate the dependence of photothermal effect on concentration of PEG-SWNTs, laser power density and laser treatment time. 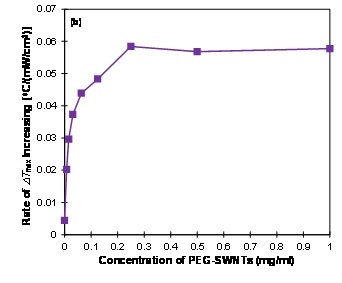 PEG-SWNTs solution preparation: The SWNTs used in this study were purchased from Carbon Solutions (Riverside, California, USA, part number P7-SWNT). The SWNTs came in a form that had already been covalently functionalized with PEG for water solubility . Based on the product specifications, the average diameter and length of the PEG-SWNTs were 4.3 and 580 nm, respectively. The PEG-SWNTs were dissolved in double distilled water by ultrasonic vibrating for 2 hours and then diluted to the desired concentrations for use in our experiments. Nine concentrations of PEG-SWNTs solution were prepared with each solution in triplicate. Eight concentrations of PEG-SWNTs solution were prepared by two-fold serial dilution from 1 mg/ml to 0.0078 mg/ml (i.e., 1, 0.5, 0.25, 0.125, 0.0625, 0.0313, 0.0156, 0.0078 mg/ml). One solution without PEG-SWNTs was used as control (i.e., pure double distilled water). The solutions were placed in a 96-well plate. The diameter and depth of each well were 0.65 ± 0.01 cm and 1.09 ± 0.01 cm, respectively. Each well could hold 350 l of the PEG-SWNTs solution. In this experiment, 200 l of each PEG-SWNTs solution was used to avoid spillover. This diameter and volume of PEG-SWNTs solution was chosen to simulate the size of the tumor in the experimental animals. A continuous wave (c.w.) 785-nm diode laser (BRM-785-1.0-100-0.22-SM; B&W Tek, Inc., Newark, DE) was used to irradiate the PEG-SWNTs solutions. The laser was delivered to the sample using a 100-μm core diameter optical fiber with an output power of 1 W. The Numerical Aperture (NA) of the fiber is NA = 0.22. The laser beam has a divergence angle of 12.7o. 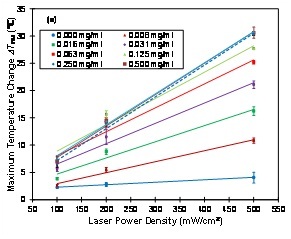 Three laser power densities were chosen for this study: 100, 200 and 500 mW/cm2. The power densities were controlled by varying the distance from the fiber tip to the surface of the samples. When the distance was set to be 7.92, 5.59 and 3.54 cm, the diameter of the laser spot was 3.57, 2.52 and 1.60 cm, which led to the power density of 100, 200 and 500 mW/cm2 respectively. The 96-well plate was covered by a piece of tinfoil with a punch hole of 0.65 cm in diameter, which was put directly on top of the well for sample irradiation. The laser beam was shone upon the PEG-SWNTs solution vertically, covering the full-size of the well. Laser beam that was beyond the punch hole was blocked by the tinfoil. During laser irradiation, the temperature of the PEG-SWNTs solutions was measured with an infrared thermometer (Cole-Parmer, Montreal, Quebec, Canada, model number: RK-35639-00). The measurement range of the thermometer is -32 to 535ºC with an accuracy of 0.2ºC. The thermometer was mounted at 25 cm from the surface of the PEG-SWNTs solution at an angle of 10º from the normal to avoid blocking of the laser beam. Each sample was irradiated with the specified laser power densities for 10 minutes. The temperature of the PEG-SWNTs solutions was measured at a 1-minute interval after irradiation for 10 minutes with each reading being taken about 5 seconds. Each sample was irradiated once, and every concentration of PEG-SWNTs solution was repeated 3 times. The average of the three measurements of each concentration was used for data analysis. The change of the temperature (Temperature change ∆T), which is the difference of the temperature at any time point and the room temperature before laser irradiation, was used as a measure of the treatment effect. The temperature change ∆T of PEG-SWNTs solutions when irradiated with the three laser power densities of 100, 200 and 500 mW/cm2 are shown in (Figures 1A-C). It can be seen that the temperature increases with irradiation time for all the solutions and all three power densities. It increases much faster within the first 3 minutes of irradiation and then gradually levels off when approaching 10 minutes. The ∆T value at the 10 minutes time point represents the maximum temperature change for a given solution at a given laser power density and is denoted as ∆Tmax. The temperature is increased by as much as 10-30ºC (∆Tmax) for PEG-SWNTs solutions of >0.125 mg/ml with laser power density of 200 - 500 mW/cm2. This is enough to cause cell apoptosis and/or necrosis for photothermal therapy [2,37]. The dependence of the maximum temperature change ∆Tmax on laser power density for various concentrations of PEG-SWNTs is shown in (figure 2A). It is found that ∆Tmax increases linearly with laser power density for any concentration of PEG-SWNTs. The slope of the lines represents the rate of ∆Tmax increasing as a function of laser power density at a specific concentration of PEG-SWNTs, which is shown in (figure 2B). It shows that the rate of ∆Tmax increasing is a fast increasing function at low concentrations (< 0.3 mg/ml) and levels off at high concentrations (>0.3 mg/ml), indicating that the rate of ∆Tmax increasing cannot be further improved by solely increasing the concentration of PEG-SWNTs. The dependence of the maximum temperature change ∆Tmax on concentration of PEG-SWNTs solutions with laser irradiations of 100, 200 and 500 mW/cm2 is shown in (figure 3). It is found that maximum temperature change ∆Tmax increases sharply for any of the three laser power density at low concentrations of PEG-SWNTs (<0.125 mg/ml) and then levels off beyond 0.25 mg/ml. For laser power density of 100 or 200 mW/cm2, the maximum temperature change ∆Tmax peaks at 0.125 mg/ml and drops slightly at higher concentrations. We studied the photothermal properties of PEG-SWNTs under various conditions. We found that PEG-SWNTs can effectively convert the absorbed laser energy into heat. The temperature change ∆T of the PEG-SWNTs solution depends heavily on the length of laser irradiation, laser power density, and concentration of PEG-SWNTs. The temperature of PEG-SWNTs solution increases with the length of laser irradiation for any given concentration of PEG-SWNTs and laser power densities (Figures 1A-C). Therefore, increasing treatment time is an effective way to raise the temperature of the PEG-SWNTs solutions. However, the temperature increases rapidly for the first few minutes and then levels off after about 10 minutes. This is because the heat dissipation increases with the raising temperature. The temperature leveling off reflects that a balance has been reached between the heat generation and the heat dissipation. The maximum temperature that a solution can achieve depends on the concentration of PEG-SWNTs and laser power density. Therefore if certain temperature is needed to generate a clinical treatment effect, it is insufficient by solely increasing the treatment time. Optimal concentration of PEG-SWNTs and laser power density are needed. The maximum temperature change ∆Tmax is found to increase linearly with laser power density for any given concentration of PEG-SWNTs solution (Figure 2A). This linear dependence indicates that the absorption of PEG-SWNTs is a linear effect. Therefore, increasing laser power density is an effective way to raise the temperature for any given PEG-SWNTs solutions. The rate of ∆Tmax increasing with laser power density depends on the concentration of PEG-SWNTs (Figure 2B). Higher rate of ∆Tmax increasing indicates that the temperature change is more sensitive to laser power density. The optimal concentration for photothermal therapy can be determined from the rate of ∆Tmax increasing plot, which is around 0.25 mg/ml in this study, as the ∆Tmax increasing cannot be further increased by solely increasing the concentration beyond this value. In this regime, the maximum temperature change ∆Tmax can only be increased by laser power density (assuming laser irradiation time is fixed). The maximum rate of temperature change is ~0.057˚C/mW/cm2 in this experiment. Therefore, if the laser power density is increased by 100 mW/cm2, the temperature will be increased by about 5.7˚C. The maximum temperature change ∆Tmax of the PEG-SWNTs solutions increases with the concentration of PEG-SWNTs for a given laser power density and saturates at about 0.125 – 0.25 mg/ml (Figure 3). This phenomenon was observed in other carbon nanotube studies as well but with no explanation of the underlying mechanisms. For example, Ghosh et al.,  studied aqueous solution of DNA-encased Multi-Walled carbon Nanotubes (MWNTs) irradiated with a 1064 nm laser at 2W, 3W and 4W power. They found that the solution temperature was increased for 1, 5, 10, 25 and 50 μg/ml, and saturated at 75 and 100 μg/ml. Whitney et al.,  studied single-walled carbon nanohorns heated with a c.w. laser at wavelength 1064 nm and irradiance of 40 W/cm2 for duration of 0–6 minutes. They found that the temperature was saturated at 50ºC for concentrations between 0.085 and 0.333 mg/ml. The saturation of temperature at certain concentration of PEG-SWNTs may be related to the depletion of light . The underlying mechanism could be that when the concentration of PEG-SWNTs is high enough the light is completely absorbed by the solution and therefore, even if the concentration of PEG-SWNTs is further increased, there are no more photons that could be absorbed to generate more heat. The level off of the rate of ∆Tmax increases versus PEG-SWNTs concentration curve (Figure 2B) at and above 0.25 mg/ml is due to the same mechanism of depletion of light at high concentrations. At the laser power densities of 100 and 200 mW/cm2, we observed a maximum at 0.125 mg/ml on the maximum temperature change ∆Tmax versus PEG-SWNTs concentration curves (Figure 3). This could be explained by considering the high thermal conductivity of PEG-SWNTs, which is approximately 6,600 W/mK at room temperature , about four orders higher than the thermal conductivity of the solvent (double distilled water, 0.6 W/mK). Because the laser beam is depleted, there is no more energy being absorbed by the solution even if the concentration of PEG-SWNTs is further increased. However, the thermal conductivity of the solution is increased in higher concentrations, which dissipates more heat and thus makes the temperature drop slightly for higher concentrations. This maximum was not observed for our high laser power experiment (500 mW/cm2) and in other studies that used higher laser power densities of 2 – 4 W/cm2 and 40 W/cm2 [24,26]. This might be because the heat dissipation effect of the thermal conductivity increasing occurred before the laser depletion, thus no maximum appeared. For higher laser powers, the light depletion occurs at high PEG-SWNT concentrations. The observed temperature saturation effect when the PEG-SWNT concentration is higher than certain values could have significant implementations for in vitro cellular and in vivo tissue experiments. When the concentration is increased beyond the threshold value, it will not help with increasing the temperature anymore. Staying at lower concentration will help with minimizing any side effects associated with SWNTs. For similar reasons, our discovery that the temperature maximizes at an optimized concentration (Figure 3) could lead to optimized treatment parameters: lower laser power density, lower SWNT concentration, and yet maximum temperature increase. This study was performed with PEG-SWNTs solution with water as solvent, generating a homogeneous SWNTs suspension. While in an in vitro cell culture or an in vivo tissue system, SWNTs could form aggregates with different absorption capacity, the above detailed studies need to be repeated to find out the system specific optimal parameters (SWNTs concentrations and laser power densities) for desired photothermal therapies. The endpoint will include not only the temperature change, but also cell/tissue viability. In conclusion, we studied the photothermal properties of PEG-SWNTs under various treatment conditions. We found that the temperature of PEG-SWNTs solution increases linearly with laser power density and nonlinearly with irradiation time and concentration. At a given laser power density, the temperature increasing with SWNT concentration is saturated at certain point. At lower laser power densities, the temperature increasing reaches a maximum value at an optimized PEG-SWNT concentration. Based on this observation, optimized treatment parameters (laser power density and SWNT concentration) could be obtained. This solution treatment experiment suggests that the optimal concentrations for photothermal therapy assisted with PEG-SWNTs are within the range of 0.125-0.25 mg/ml. The temperature of solutions (>0.125 mg/ml) can be increased as much as 10 - 30˚C for laser power density of 200 - 500 mW/cm2, sufficient to cause cell apoptosis and/or necrosis. For in vitro cellular and in vivo tissue studies, similar experiments could be performed to find the optimal treatment parameters. This study was funded by National Natural Science Foundation of China (Grant No. 31170963) and the Canadian Dermatology Foundation. We greatly acknowledge the fruitful discussion with Dr. David I. McLean and technical support of Mr. Wei Zhang, Mr. Soroush Merchant, Dr. Michael Short, Dr. Michael Chen and Dr. Defu Chen. Fiorito S (2008) Carbon nanotubes: angels or demons? Pan Stanford Publishing Pte Ltd, Singapore. Huang N, Wang H, Zhao J, Lui H, Korbelik M, et al. (2010) Single-wall carbon nanotubes assisted photothermal cancer therapy: Animal study with a murine model of squamous cell carcinoma. Lasers Surg Med 42: 638-648. Sailor MJ, Park JH (2012) Hybrid nanoparticles for detection and treatment of cancer. Adv Mater 24: 3779-3802. Schrand AM, Stacy BM, Payne S, Dosser L, Hussain SM (2011) Fundamental examination of nanoparticle heating kinetics upon near infrared (NIR) irradiation. ACS Appl Mater Interfaces 3: 3971-3980. Pacurari M, Lowe K, Tchounwou PB, Kafoury R (2016) A Review on the Respiratory System Toxicity of Carbon Nanoparticles. Int J Environ Res Public Health 13: 325. Saito N, Haniu H, Usui Y, Aoki K, Hara K, et al. (2014) Safe clinical use of carbon nanotubes as innovative biomaterials. Chem Rev 114: 6040-6079. Gulati N, Gupta H (2012) Two faces of carbon nanotube: toxicities and pharmaceutical applications. Crit Rev Ther Drug Carrier Syst 29: 65-88. Schipper ML, Nakayama-Ratchford N, Davis CR, Kam NWS, Chu P, et al. (2008) A pilot toxicology study of single-walled carbon nanotubes in a small sample of mice. Nat Nanotechnol 3: 216-221. Sheardy AT, Taylor JJ, Chilek JL, Li S, Wang R, et al. (2012) Study of the near infrared-mediated heating of dispersions of protein-coated pristine and carboxylated single-walled carbon nanotubes. Int J Nanosci 11: 1250034. Adeli M, Soleyman R, Beiranvand Z, Madani F (2013) Carbon nanotubes in cancer therapy: a more precise look at the role of carbon nanotube-polymer interactions. Chem Soc Rev 42: 5231-5256. Gong H, Peng R, Liu Z (2013) Carbon nanotubes for biomedical imaging: the recent advances. Adv Drug Deliv Rev 65: 1951-1963. Zhang W, Zhang Z, Zhang Y (2011) The application of carbon nanotubes in target drug delivery systems for cancer therapies. Nanoscale Res Lett 6: 555. Singh R, Torti SV (2013) Carbon nanotubes in hyperthermia therapy. Adv Drug Deliv Rev 65: 2045-2060. Wang L, Zhang M, Zhang N, Shi J, Zhang H, et al. (2011) Synergistic enhancement of cancer therapy using a combination of docetaxel and photothermal ablation induced by single-walled carbon nanotubes. Int J Nanomedicine 6: 2641-2652. Marches R, Mikoryak C, Wang RH, Pantano P, Draper RK, et al. (2011) The importance of cellular internalization of antibody-targeted carbon nanotubes in the photothermal ablation of breast cancer cells. Nanotechnology 22: 095101. Xiao Y, Gao X, Taratula O, Treado S, Urbas A, et al. (2009) Anti-HER2 IgY antibody-functionalized single-walled carbon nanotubes for detection and selective destruction of breast cancer cells. BMC Cancer 9: 351. Fisher JW, Sarkar S, Buchanan CF, Szot CS, Whitney J, et al. (2010) Photothermal response of human and murine cancer cells to multiwalled carbon nanotubes after laser irradiation. Cancer Res 70: 9855-9864. Wust P, Hildebrandt B, Sreenivasa G, Rau B, Gellermann J, et al. (2002) Hyperthermia in combined treatment of cancer. Lancet Oncol 3: 487-497. Roti Roti JL (2008) Cellular responses to hyperthermia (40-46 degrees C): cell killing and molecular events. Int J Hyperthermia 24: 3-15. Gannon CJ, Cherukuri P, Yakobson BI, Cognet L, Kanzius JS, et al. (2007) Carbon nanotube-enhanced thermal destruction of cancer cells in a noninvasive radiofrequency field. Cancer 110: 2654–2665. Picou L, McMann C, Elzer PH, Enright FM, Biris AS, et al. (2010) Spatio-temporal thermal kinetics of in situ MWCNT heating in biological tissues under NIR laser irradiation. Nanotechnology 21: 435101. Weissleder R (2001) A clearer vision for in vivo imaging. Nat Biotechnol 19: 316-317. Burke A, Ding X, Singh R, Kraft RA, Levi-Polyachenko N, et al. (2009) Long-term survival following a single treatment of kidney tumors with multiwalled carbon nanotubes and near-infrared radiation. Proc Natl Acad Sci USA 106: 12897-12902. Ghosh S, Dutta S, Gomes E, Carroll D, D’Agostino R, et al. (2009) Increased Heating Efficiency and Selective Thermal Ablation of Malignant Tissue with DNA-Encased Multiwalled Carbon Nanotubes. ACS Nano 3: 2667–2673. Moon HK, Lee SH, Choi HC (2009) in vivo near-infrared mediated tumor destruction by photothermal effect of carbon nanotubes. ACS Nano 3: 3707-3713. Whitney JR, Sarkar S, Zhang J, Do T, Young T, et al. (2011) Single walled carbon nanohorns as photothermal cancer agents. Lasers Surg Med 43: 43-51. Zhou F, Xing D, Ou Z, Wu B, Resasco DE, et al. (2009) Cancer photothermal therapy in the near-infrared region by using single-walled carbon nanotubes. J Biomed Opt 14: 021009. Lim DK, Barhoumi A, Wylie RG, Reznor G, Langer RS, et al. (2013) Enhanced photothermal effect of plasmonic nanoparticles coated with reduced graphene oxide. Nano Lett 13: 4075-4079. Wang L, Shi J, Jia X, Liu R, Wang H, et al. (2013) NIR-/pH-Responsive drug delivery of functionalized single-walled carbon nanotubes for potential application in cancer chemo-photothermal therapy. Pharm Res 30: 2757-2771. Zhou F, Wu S, Song S, Chen W R, Resasco D E, et al. (2012) Antitumor immunologically modified carbon nanotubes for photothermal therapy. Biomaterials 33: 3235-3242. Yu JG, Jiao FP, Chen XQ, Jiang XY, Peng ZG, et al. (2012) Irradiation-Mediated Carbon Nanotubes' Use in Cancer Therapy. J Cancer Res Ther 8: 348-354. Krishnan S, Diagaradjane P, Cho SH (2010) Nanoparticle-mediated thermal therapy: evolving strategies for prostate cancer therapy. Int J Hyperthermia 26: 775-789. Dewey WC (2009) Arrhenius relationships from the molecule and cell to the clinic. Int J Hyperthermia 25: 3-20. Rylander MN, Feng Y, Bass J, Diller KR (2005) Thermally induced injury and heat-shock protein expression in cells and tissues. Ann N Y Acad Sci 1066: 222-242. Rylander MN, Feng Y, Zimmermann K, Diller KR (2010) Measurement and mathematical modeling of thermally induced injury and heat shock protein expression kinetics in normal and cancerous prostate cells. Int J Hyperthermia 26:748-764. Zhao B, Hu H, Yu A, Perea D, Haddon RC (2005) Synthesis and characterization of water soluble single-walled carbon nanotube graft copolymers. J Am Chem Soc 127: 8197-8203. Mocan T, Matea CT, Cojocaru I, Ilie I, Tabaran FA, et al. (2014) Photothermal Treatment of Human Pancreatic Cancer Using Pegylated Multi-Walled Carbon Nanotubes Induces Apoptosis by Triggering Mitochondrial Membrane Depolarization Mechanism. J Cancer 5: 679-688. Chen CJ, Chen DH (2013) Preparation and near-infrared photothermal conversion property of cesium tungsten oxide nanoparticles. Nanoscale Res Lett 8: 57. Berber S, Kwon YK, Tomanek D (2000) Unusually high thermal conductivity of carbon nanotubes Phys Rev Lett 84: 4613-4616. Figure 1A-C: Dependence of the temperature change ∆T on irradiation time for various concentrations of PEG-SWNTs at laser power density of (A) 100 mW/cm2, (B) 200 mW/cm2, (C) 500 mW/cm2. Data shown: mean ± standard deviation. Figure 2A: Dependence of the maximum temperature change ∆Tmax on laser power density at various concentrations of PEG-SWNTs. Solid and dashed lines are linear fitting results. Figure 2B: The rate of ∆Tmax increasing with laser power density versus the concentration of PEG-SWNTs. The rate of ∆Tmax increasing is defined as the slope of the lines in (a). Higher rate of ∆Tmax increasing indicates that the temperature is more sensitive to laser power density. ∆Tmax was the temperature change at 10 minutes after laser irradiation. Figure 3: Dependence of the maximum temperature change ∆Tmax on the concentrations of PEG-SWNTs for three laser power densities at 100, 200 and 500 mW/cm2. ∆Tmax was the temperature change at 10 minutes after laser irradiation. Table 1: Number-average Molecular weight (Mn), Molecular weight distribution (Mw/Mn), hydrodynamic radius (Rh), and ?-potential for the polymers. aCalculated from Equation (2), bEstimated from 1H NMR, cEstimated from GPC, dEstimated from DLS. Table 2: Dynamic and static light scattering data for PIC micelles in 0.1 M NaCl. aEstimated by SLS in 0.1 M NaCl, bEstimated by DLS in 0.1 M NaCl, cAggregation number of PIC micelles calculated from Mw(SLS) of PIC micelles determined by SLS and Mw of the corresponding unimers determined by 1H NR and GPC, dDensity calculated from Equation (3). Citation: Huang N, Tian Y, Wang H, Zhao J, Liu H, et al. (2017) Photothermal Effect of PEG-Functionalized Single-Walled Carbon Nanotubes. J Nanotechnol Nanomed Nanobiotechnol 4: 012.